This series of DVDs presented by Richard Amos, brings more than 30 years of dedicated Shotokan Karate practice to students and teachers alike. Its clearly defined structure and powerful format allows students of this collection to build a foundation leading to mastery of this great art. Even the advanced karate practitioner will find it useful. The first in this series introduces kihon (basics), kata (the prearranged form) and kumite (cooperative pair-work) for 9th & 8th kyu (level): the beginning grades of Shotokan Karate. 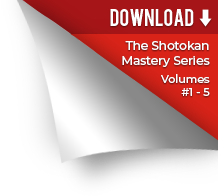 Shotokan Mastery Volume Two now available! This highly acclaimed series continues with in-depth explanations and demonstrations of the Kihon, Kata (Heian Nidan and Heian Sandan) and Kumite for 7th & 6th kyu, the green belt level of Shotokan Karate. This instructional series continues the path towards Shotokan Mastery. This volume shows great detail and demonstrates dynamically the Kihon, Kata (Heian Yondan and Heian Godan) and Kumite necessary for the purple belt level of Shotokan Karate. This series of DVDs continues with volume 5 representing the syllabus for shodan, the black belt level of Shotokan karate. It includes the kihon, kata and kumite for 1st dan with detailed explanations and examples of bunkai (the applications) of the kata Kanku Dai and Jion.